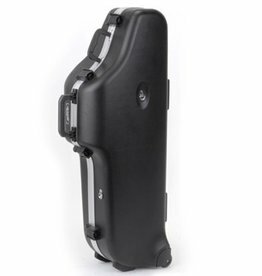 Contoured Pro case with handy "stuff" pouches on the exterior of the case. Elegant black hardware and ergonomic handle design make the case the ultimate in form and function. Interior compartment for neck and mouthpiece. A great value case (with wheels!) for your bari sax.